Even in this digital age, one of the vestiges of bygone days that people still cling to are brochures. Travelers and consumers often still want something to hold in their hand – a guide, a map, an event poster. In a time where there is an app for everything, the paper and ink Visitors Guide still reigns supreme. With that in mind, the Johnston County Visitors Bureau (JCVB) is pleased to announce the arrival of the 2019 Official Johnston County Visitors Guide. This year’s guide return of last year&apos;s popular magazine style cover - this year promoting Bentonville 2020. Every 5 years the Bentonville Battlefield State Historic Site stages a large-scale, 2-day reenactment of the Battle of Bentonville. It was the largest battle to take place in NC and the last major battle of the Civil War. The last major reenactment took place in 2015 with 2,500 reenactors and over 64,000 spectators. The weekend of March 20-22, 2020 will be the next reenactment and the JCVB is already working to let people know. The JCVB prints 50,000 Visitors Guide each year to promote the county and the guide is entirely sponsored by the 3% county-wide occupancy tax, which is paid by visitors to the county staying in area hotels. Guides are distributed to all NC Welcome Centers in the state, RDU International Airport, AAA Offices along the eastern seaboard and along I-40 west. Guides are in visitor centers across North Carolina, as well as, around the county in more than 100 locations such as hotels, attractions, Chambers of Commerce, town halls and retail stores. 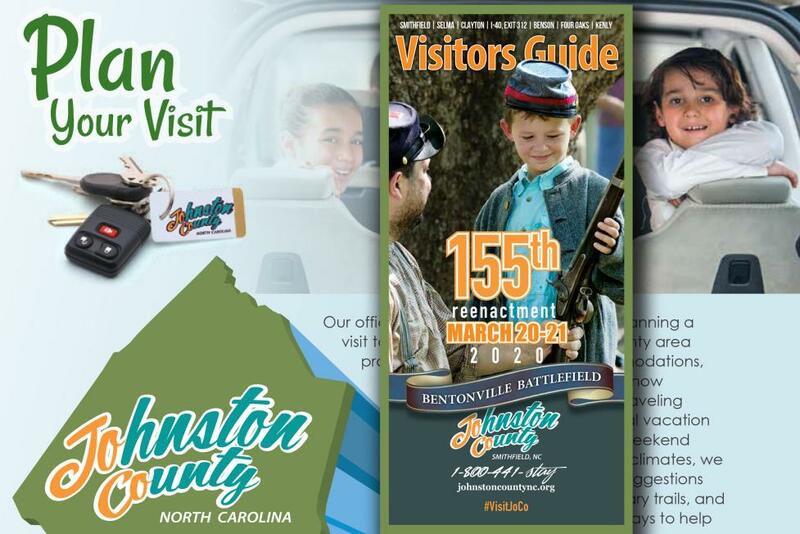 Please contact the Visitors Bureau, to receive a copy of the Visitors Guide or to learn more about Johnston County, at (919) 989-8687 or visit our web site, www.johnstoncountync.org. You can also scroll to the bottom of this page, click on the cover of the guide, and fill-out a small form that will allow you to download an e-copy of the guide in pdf format.